I decided a few months ago that I really needed to start teaching my soon to be four year old some basic skills. Things like learning to be on a schedule and things that should be routine. Not just something we do when I think about it or when we remember...or more likely, when she is bored and I'm scrambling to be that oh so creative Momma, with my Thirtyone bag of arts, crafts, and games to thrill and educate her on a whim! There are some basics that she does well and I think I focused too much on those things and sort of...got lazy on other things she should or could be learning. She does surprisingly well with bathing and brushing her teeth with supervision. So, what else could I be teaching her now? The last two weeks we have been learning together. She still wants me hovering over each"worksheet" but it is a start. If I move or try to leave her to do it herself, she immediately is "done". Unless, it is art or painting. 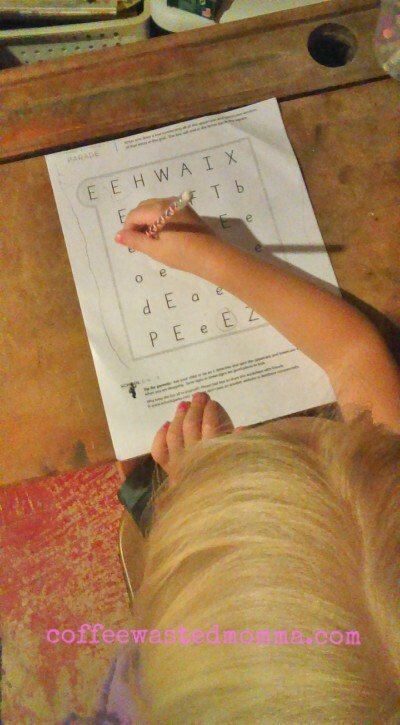 I have started by using free printable sites and found numerous pages for her to learn the alphabet, trace letters, find letters or objects, decorate or design her own coloring page, count and much more. We are starting with the letter E this week. 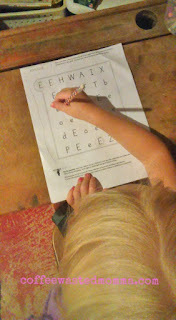 This letter is obviously familiar to her as her name begins with E, so I found her tons of pages all about that letter. She loves that she knows "Her" letter and gets super excited every time she finds it...ANYWHERE! I admit, I was totally impressed at how well she did! We also did a little art work this week. She named each color as she asked to have it opened. 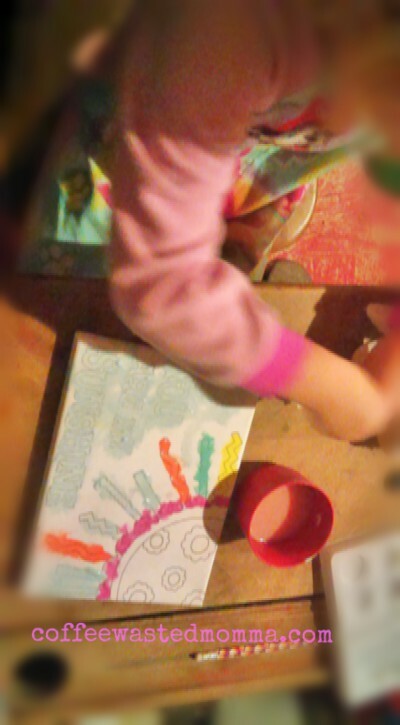 I can't believe how well and carefully she finished this...on her own! This girl can stay in the lines like a four year old BOSS! 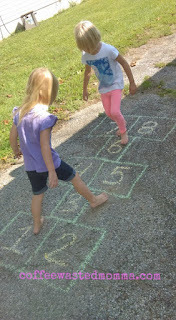 The weather has been amazing this week, so we took our "class" outside to have some cousin, play, and learning time! Hopscotch is always a WIN! They had sooo much fun and we mixed it up a bit. They could tip toe, big jump, hop or run on the numbers. They could call out a number and the other had to "jump" to find it. There are so many ways to add learning to a simple chalk graph of numbers. They even got a little P.E. time and lots of laughs. School and learning shouldn't have to feel like a battle between you and the "student". If you love to learn and show them how to do it creatively, it is a win/win! CoffeeWastedMomma and Little E = week #1 done! We all need a little Momma love!